S.O.W. 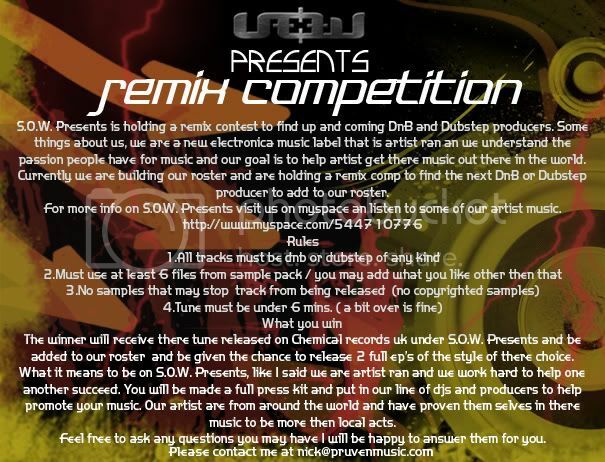 Presents is holding a remix contest to find up and coming DnB and Dubstep producers. Some things about us, we are a new electronica music label that is artist ran an we understand the passion people have for music and our goal is to help artist get there music out there in the world. Currently we are building our roster and are holding a remix comp to find the next DnB or Dubstep producer to add to our roster. For more info on S.O.W. Presents visit us on myspace an listen to some of our artist music. What you win The winner will receive there tune released on Chemical records uk under S.O.W. Presents and be added to our roster and be given the chance to release 2 full ep’s of the style of there choice. What it means to be on S.O.W. Presents, like I said we are artist ran and we work hard to help one another succeed. You will be made a full press kit and put in our line of djs and producers to help promote your music. Our artist are from around the world and have proven them selves in there music to be more then local acts. Feel free to ask any questions you may have I will be happy to answer them for you. ''Music is my life and DnB is my soul"
drumnbass.be forum » Production » Competitions » Remix comp!!!! !